There’s a gap in Australia’s tech ecosystem – product managers. They guide the creation, execution and finalisation of a product – creating something that users love. In Australia, there just aren’t enough of them. “The Australian market had a fundamental shortage of product management skills and called for the adoption of marketplace-style cooperation among Australian small businesses”, said Adrian Turner, CEO at CSIRO’s Data61. Product management is one of Data61’s key differentiators as a research and development delivery partner. We prioritise discovery of market problems early on, to ensure we’re solving for the greatest need. Whether that’s charting new ground for Australia’s artificial intelligence roadmap by responding to industry needs, unlocking insights in the telehealth field with spinouts like Coviu, or bringing product management rigour to our platforms in regulation technology or privacy preservation, Data61 bridges the gap from research and development to market. At Data61, we’ve decided to take the lead in trying to address that gap, by developing a research-driven Associate Product Manager (APM) program. Alumni of Google’s 2014 APM program include several big Silicon Valley names, who’ve gone on to leadership roles in tech companies that now dominate global industries. Product managers need to lead in situations that are in rapid flux, involve untested new technologies and several constantly shifting variables. This type of skill set is exactly what we need to develop within Australia to reach our innovation goals. Data61’s APM program runs for two years (starting in May 2018). It involves a professional development curriculum that fast tracks the up-skilling of participants, exposing them to peer-learning sessions, internal and external mentors, Data61 Product Guild events, and exposure to multiple business, research and technology perspectives. The program participants will rotate every six months through different products, platforms and market opportunities as they hone and develop their skills. The APMs will then be well placed to be product and tech leaders in Australia, driving innovation across all parts of the ecosystem. 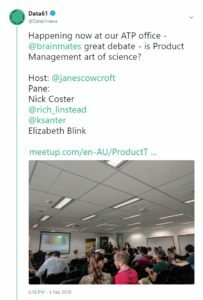 Is product management an art or a science? As part of the launch, we welcomed four new team members: Aneesha Govil, Marie Truelove, Gabrielle Provost and Maria Wikstrom. A common element across the new team is the breadth and scale of the challenges of being an APM. “The opportunity to work on some truly advanced and cutting-edge projects undertaken by Data61”, said Gabrielle. “[That happens] whilst remaining in a generalist position that allows me to engage with every aspect of commercialising new technology”. In the context of our APM program, leadership is incredibly valuable as a skill that isn’t unique to a specific technology or industry. Jane Polak Scowcroft, Data61’s Head of Product, who created the program by leveraging industry best practice and with input and guidance from tech leaders in Australia and Silicon Valley, is proud of the role that Data61 can play to develop Australia’s future leaders. “Creating the right environment where it’s safe to fail, and fast to learn, will be a key component of the success of the APMs and the program itself”. “I hope we are also able to inspire and encourage other parts of Australian tech industry to adopt similar programs” she says. Networks are embedded in Data61‘s DNA. The task of filling this leadership and talent gap in Australia’s product management ecosystem falls naturally to the smart young minds of CSIRO‘s Data61, and we’re optimistic about our new program’s capacity to help create Australia’s next batch of diverse leaders. "Jane Scowcroft believes that every career of the future will be a "tech job", in one way or another. So, in that respect she tells me, "the future looks brighter for everyone who touches tech""
Where can I find out more about this? And has it already started (.. starting May’18, article published July’18).